In fact, according to Oxford University cardiovascular researcher J E Digby, "Nicotinic acid (NIACIN) is the most potent treatment clinically available for lowering LDL cholesterol and VLDL cholesterol and raising HDL cholesterol." See Niacin for more uses & symptoms of deficiency. 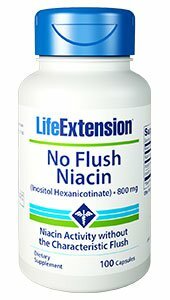 No Flush Niacin also contains Inositol a key intermediate of secondary messengers and a primary component of cellular membrane phospholipids which is involved in a number of biological processes. Inositol has been found to be essential for calcium and insulin signal transduction, and serotonin activity modulation. Research indicates inositol is beneficial for stabilizing moods. DIRECTIONS:Take one (1) capsule with food, or as recommended by a healthcare practitioner.